Oil prices fell for a sixth day on Friday after Iran announced plans to boost production and US crude output hit record highs, adding to concerns about a sharp rise in global supplies. The falls come amid a rout in global share markets as inflation fears grip investors. 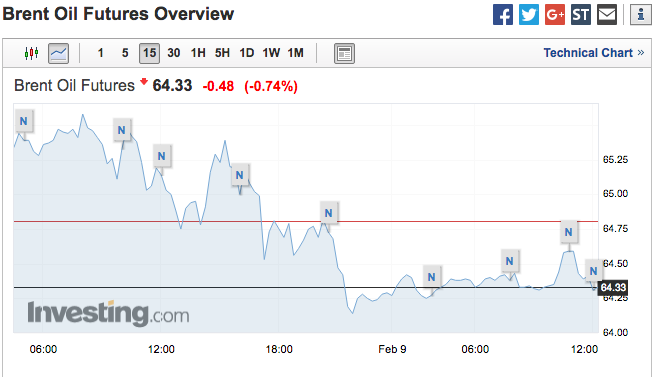 Brent futures were down 38 cents or 0.6%, at $64.43 a barrel by 0146 GMT. On Thursday, Brent fell 1.1% to its lowest close since Dec. 20. US West Texas Intermediate (WTI) crude was down 54 cents, or 0.9%, at $60.61, having settled down 1% in the previous session at its lowest close since Jan. 2. Both contracts have fallen more than 9% from this year’s high point in late January. “Bets on further rising oil and metals prices, for example by hedge funds, have climbed to excessively bullish levels,” said Carsten Menke, commodities research analyst at Swiss Bank Julius Baer, according to Reuters. “We see oil prices dropping towards and below $60 per barrel,” he said. OPEC member Iran on Thursday announced plans to increase production within the next four years by at least 700,000 barrels a day. Meanwhile, the US Energy Information Administration (EIA) this week said crude production last week rose to a record high of 10.25 million barrels per day (bpd). At that level, US production would overtake current output in Saudi Arabia, the biggest producer in the Organization of the Petroleum Exporting Countries. OPEC and other producers, including Russia, have cut production since January 2017 to force down global inventories, but these cuts have been offset by rising US oil production. PreviousThe stock market rollercoaster: Should investors be worried?